Once in a while a movie comes along that defies categorization. 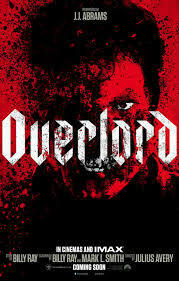 Being part war drama, part horror mystery, part action frenzy, Overlord is such a movie. It’s also difficult to categorize because it’s completely insane. Five American paratroopers survive a perilous landing in the French countryside on the eve of D-Day, part of Operation Overlord, during WWII. What starts out as a clear mission to destroy a Nazi radio tower built on a church rooftop soon transforms into a gruesome fight for survival with flamethrowers, syringes, and a dark basement laboratory. The film partly highlights how Nazis were not just tormentors, murderers, and rapists but also cruel experimenters. That’s where this film goes crazy. Watching Overlord felt like jumping in a Lamborghini, driving at 100 miles per hour non-stop, rock music blasting as loudly as possible from the stereo, and leaving nothing but destruction in my path. This kind of tone for a film ensures for a thrilling drive, and this drive offers tense moments of silence, jump scares, and gory death scenes which are all fun. But going at 100 miles per hour for most of the film, the only inevitable end is a spectacular, and ridiculous, crash-filled with explosions, fist fights, a meat hook, and too many ideas. I squirmed with revulsion numerous times at the blood-soaked horror moments. But it’s a shame this film couldn’t get its many ideas to gel together more cohesively. At least it has fun being completely crazy, but Overlord will not be remembered for anything special.